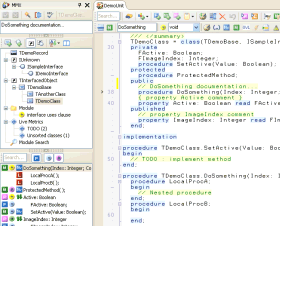 Integrated with Delphi 10 – 10.3 Rio (previous versions supported until V13). classes and inheritance relations for the current module. The Members view (bottom) show the filtered members for the selected class. Navigation history help finding your way around in code. Classes and members can be created and modified through drag and drop or by selecting options in dedicated dialogs. Entity Insight™ bar – quick access to attributes for selected entities. Live Documentation support any comment style. Cut,Copy and Paste let you pick up a class, properties and methods and duplicate them or move them to another class or module. Where necessary names and modifiers are automatically adjusted. Drag and Drop Members on a class to copy / move / convert them. Use Editor Refactoring’s to refactor an entity at cursor position or operate on selected code. with just one keystroke. Common tasks like Add a Field, Modify a Property and Rename Local are all invoked with just one keystroke.